To start using the Amelia Booking plugin after the general settings are configured you first must to create a Service Category. 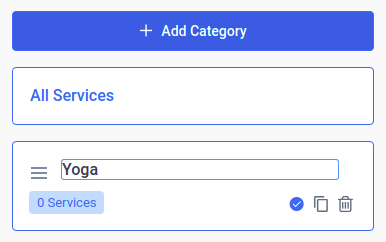 Creating a category is required because each service needs to be included in a category if the plugin is to work. Consequently, you’ll need to create at least one category to be able to start creating the services. This option is created especially for companies that provide a large number of different services to make it easier to group them. 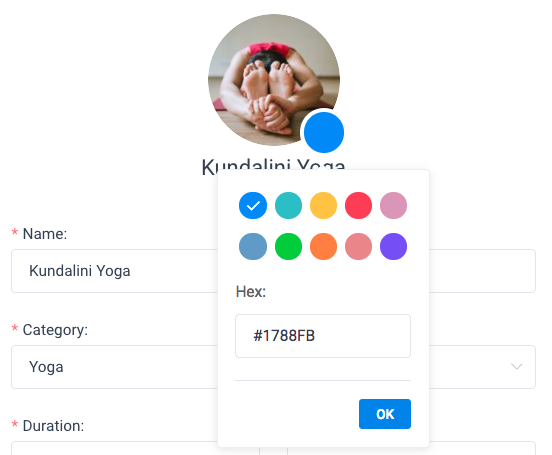 If you are not one of those companies and you don’t need to create categories, you only need to create one to use the plugin, it won’t appear on the front-end (this is explained in detail here ). On the left side of the category page, you will see an “Add Category” button. Click on the it button, write the name of your category, click on the checkmark and your category will be saved. Once you’ve saved a category you can always edit, duplicate or delete it later, using the buttons on the righthand side of the category card. 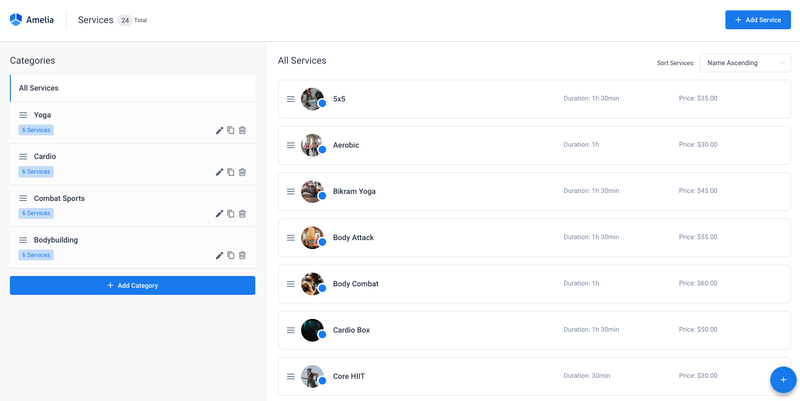 After you have created at least one category you can start creating the services. Click on the “Add Service” button or the “+” button, and the “New Service” dialog will appear. Service photo – Click on the photo placeholder, upload the picture and this picture will appear on the back-end and on the front-end for that service. Service color – Click on the blue circle and you will see the color options which you can set for each service. This color will be used for differentiating services on the Calendar in the back-end. Name – Here you need to write the service name, which is required. Category – Here you need to select the category that this service belongs to. Duration – Here you need to choose the service duration. Time slots you see in the “Duration” option are based on the setting defined in the “Default Time Slot Step” in “General Settings”. One more option that you can set regarding the service duration is Use service duration for booking a time slot in General Settings. This option you can use if you want to make time slot step the same as a service duration is in the booking process. Please note: If you change the “Default Time Slot Step” after you’ve chosen durations for services, it will not affect existing and saved services but it can cause some issues in the booking process, as your time slot will not match durations. Price – Here you need to enter the service price. The format of the price will follow the setting from the “Payments Settings”. Buffer Time Before and Buffer Time After – These options give you the possibility to set the time before and after the appointment that needs to be reserved so that another booking for the same service and employee would not be made. It will not be seen on the front-end, but it will reduce the number of free time slots in the schedule of the employee. “Buffer Time Before” can be interpreted as the time your employee needs to prepare for appointments, while “Buffer Time After” is the time after the appointment that your employee needs to rest, clean up, or do something else before being able to accept the next appointment. Like for the “Duration” option, time slots you see here are based on the setting defined in the “Default Time Slot Step” in “General Settings”. Minimum Capacity and Maximum Capacity – Here you can enter the minimum and the maximum number of persons per single service booking. If your company has a need for a group appointment (for example classes, tours, group training, etc. ), this is where you’ll define its capacity. This option is available for every employee, so you can define a different capacity for each one. Show “Bringing anyone with you” option – Here you can choose whether you want to show or hide the “Bringing anyone with you” option. If you hide this option from the Booking form you will only allow individuals to book a group appointment. Employees – Here you select the employees that will be assigned to the service. Description – Here you can add a description that will appear on the front page if you use “Front-end Booking Catalog”. From version 1.4.4 you can also add HTML here in order to better customize your description. Gallery – In this tab, you can add images to your service. These images will show up on the front page of your service if you choose the “Front-end Booking Catalog”. 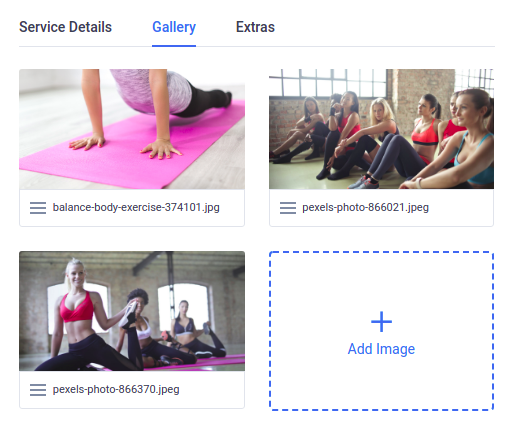 By clicking on the “Add Image” button, you can upload images from your device or choose them from your media library. By dragging them, you can adjust their order in which they will be shown on the front page of your service. If you hover over the image you will see a trash can so single click you can delete it. Duration – If you want to define additional services and give them a duration, this is where you do it. Duration is not required because there can be extras that your customers can buy without affecting the appointment’s duration (e.g. special equipment). Please note: If your extra service has a duration, you should know that currently extra time will not be multiplied by the number of persons in the booking or extras quantity, so you will see time for just one extra. Price – This is where you set a price for your extra product or service. Maximum Quantity – Here you can set the maximum number of extras that one customer can add in the booking process. For example, if you set 1, a customer will only be able to add one extra to the service. If you set more, your customers will be able to add a larger number. Description – Like in the service dialog, this is where you add a description about this extra that will appear on the “Front-end Booking Catalog”. After you’ve entered all of the data, click “Save” and your service will appear on the page. 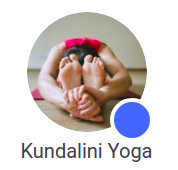 In the page header, you can see the total number of your services. You can have as many services and service extras you need, and if you have a large number of services you can filter them by clicking on the category title. Please note: When you edit a service and change the service capacity or price, once you click on the “Save” button you will see the message to choose whether you want this change to be applied only for the service or for the all assigned employees. If you choose the first option you will change a service setting and these changes will be applied only to employees created afterward. But if you choose the second option you will change this setting for all assigned employees regardless of whether they have a custom setting or not. There are three more important options in the “Edit Service” dialog : “Duplicate”, “Hide” and “Delete”. The “Duplicate” and “Hide” options are available for users with administrator and manager roles, but the “Delete” option is only available for administrators. “Duplicate” is a helpful option when you have several similar services. By using it, you won’t have to enter them all again. Open the service you want to duplicate, in the bottom left corner click on the “Duplicate” button and the same service, will open again (just the copied version). Next to the “Duplicate” is the “Hide” button. If you don’t want to delete your service, but you will not need it for some future period, you can hide it by clicking on this button. The hidden service will still be visible on the back-end of your plugin (in a gray color and with the hidden sign), but it will not be visible on the front-end of your website. Please note: If you hide a service, you will also hide the employees and locations that are connected only with this service. If they are connected with some other service too, they will stay visible. If your service has appointments in the future, you will be so informed and you will not be able to delete it. Please note: If you delete services with appointments in the past, you will also delete all past appointments, so if you want to keep records of your past appointments, the best way is to hide the service to preserve historical appointments data. From 1.5 version you can sort services on the list by choosing the type of the sorting in the “Sort Service” dropdown or you can do this by drag and drop option in the list. The order that you set here will be the order in which services will appear on the front-end forms for booking. In “Sort Service” dropdown you have four main options: Name Ascending, Name Descending, Price Ascending, and Price Descending, but you also have Custom as an option which will be automatically chosen if you move any service on the list with drag and drop option. For making the custom order by drag and drop, just click on the burger icon which you will see on each service and drag and drop the service on the list.